He's Not Dead, He's Restin'! Getting to be crunch time on getting The Guide to U.S. Newspaper Comic Strips and Cartoon Panels ready for the publisher. I'm hip-deep in putting together the cross-indexes, a job I wouldn't wish on an enemy. So despite the quote above, I'm doing anything but restin'. Just to tide you over here's the final Sunday episode of Barney Baxter, published January 22 1950. As long as I've got you here, what do you think of the title The Universal Guide to American Newspaper Comic Strips and Cartoon Panels? You'll recall that the book will not use the term "Stripper's Guide" over worries that libraries will find it ... um ... troubling. The generic working title sure doesn't have any identity or pizzazz, so I was thinking maybe "Universal Guide" might be a nudge in the right direction. Any other great titles you could suggest would be helpful. My brain has turned to mush over the past month getting the book ready, and my Imagin-O-Meter is pegged on zero. "The Universal Guide to American Newspaper Comic Strips and Cartoon Panels" sounds more like a subtitle. I would try to punch it up with something that gives a sense of the imaginative worlds created on the newspages. "Four-Color Universe" or "Worlds in Ink" are bad examples, but I think they suggest what could be a more engaging direction. I take it that's not the same Frank Miller who did The Dark Knight Returns? Waiting for new life, eh? Say, didn't Bob Nalor take this over after Miller left? Or was that just the daily? I like the authoritative sound of "The Holtz Field Guide". Sort of like Petersen's Field Guide to the Birds. "the Holtz Field Guide to Newspaper Cartoon Strips & Panels, sez it all, and leaves it open for you..... or" the International, Silver Newspaper Submarine Comics Guide & Index"
Hello, Allan---Why such an abrupt ending to the long-running BARNEY BAXTER?---Cole Johnson. Everyone else has their name on their guides, why not you too? 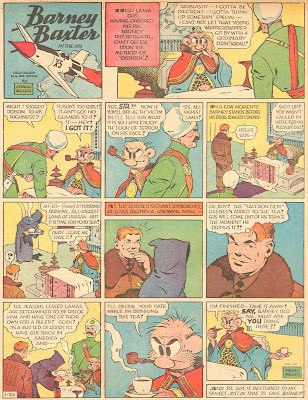 The Holtz Guide to American Newspaper Comic Strips and Cartoon Panels. Hello, Allan---Why not just call it George?---Cole J. 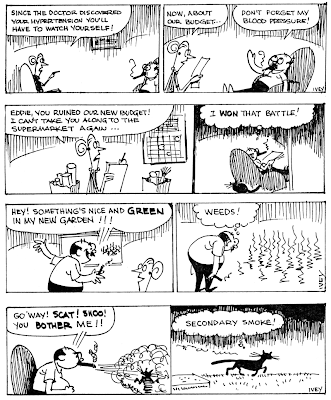 "American Newspaper Comic Strips and Cartoon Panels: An Encyclopedic Reference Guide"
"Strips and Panels: The Encyclopedia of American Newspaper Comics"
"American Newspaper Comics: An Encyclopedic Reference Guide"
Sorry to take so long responding. Re Barney Baxter, the strip ended abruptly because Frank Miller died. And Bob Naylor did do the strip 1943-46, but then Miller took control again. Re the title suggestions, a lot of interesting fodder there. I've suggested my editor come by and read your suggestions. As we've discussed before here on the blog, the New York Daily News frequently included extra features in their Sunday sections of the late 1940s to mid-60s that were never syndicated. The reason for these fillers is a little murky since there were additional Sunday features available from the Chicago Tribune-New York News Syndicate. Perhaps because most of those other features were continuities they preferred to have gag material that could be inserted purely on a space-available basis. 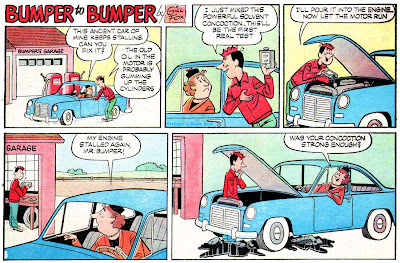 One of those unsyndicated gag features was Bumper to Bumper from the versatile pen of Gill Fox. According to the artist, he produced 20-30 installments per year of this series about a garageman from 1952-1963. Perhaps I just haven't seen the right issues of the Daily News comics section (which unfortunately has not been indexed in full) but I certainly have not seen anywhere near that many actually appearing there; in fact the only printed examples I've found are a pair from 1961-62. Does the Daily News still have a huge drawer full of these strips still unused, or have I had the bad luck to find the wrong sections of the Daily News? I found many more and have put them up on my blog about a year ago. I love Fox's work and this style appeals to me particulary. I remember that my samples ran from somewhere in 1955 to possibly 1961. At least you have another onde than I. 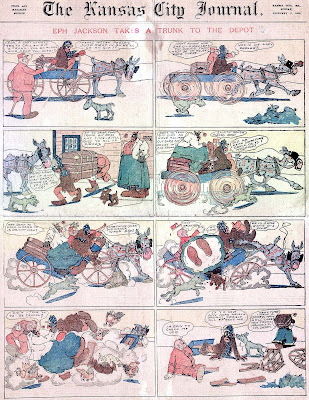 The highly regarded Saturday Evening Post cartoonist Herbert Johnson was for a short time the art director of the Sunday comics section of the Philadelphia North American (specifically 1906-09 as per Rick Marschall). During that period Johnson only applied his considerable talent to a Sunday comics feature once. His somewhat crude but energetically drawn Eph Jackson, also known as Uncle Eph Jackson, had a short run from December 3 1905 to February 11 1906. The stereotyping, both of blacks and rural whites, tempers our appreciation today for this otherwise delightful feature. Thanks again to Cole Johnson who provided the scan. I love the interaction between the two dogs along the bottom of the strip! Just recently discovered your site; keep up the great work.